For this week’s article, we partnered with Katie Stryjewski of Garnish. Check out her blog for fascinating cocktail history, as well as new recipes featuring your favorite spirits. When researching the stories behind classic cocktails, certain people and places seem to come up again and again, looming large in the history of mixology. One such place is Harry’s New York Bar in Paris. In 1911, a famous American jockey named Tod Sloane had a wild idea to open an American-style bar in Paris, France. It was so important to him to get the atmosphere right that he actually had a Manhattan bar dismantled and shipped piecemeal across the Atlantic. The New York Bar opened later that year on Thanksgiving Day. Sloane hired a Scottish bartender named Harry MacElhone to run the bar, and it proved to be a fortuitous choice. MacElhone was a genial character much beloved by his patrons. He experimented with new recipes, whipping up such classics as the French 75, Sidecar, Old Pal, Scofflaw, Boulevardier, Monkey Gland, and (some claim) the Bloody Mary. He went on to write two books filled with recipes he invented or perfected at the bar, Harry’s ABC of Mixing Cocktails (1919) and Barflies and Cocktails (1927). These have become seminal tomes of Prohibition-era mixology. 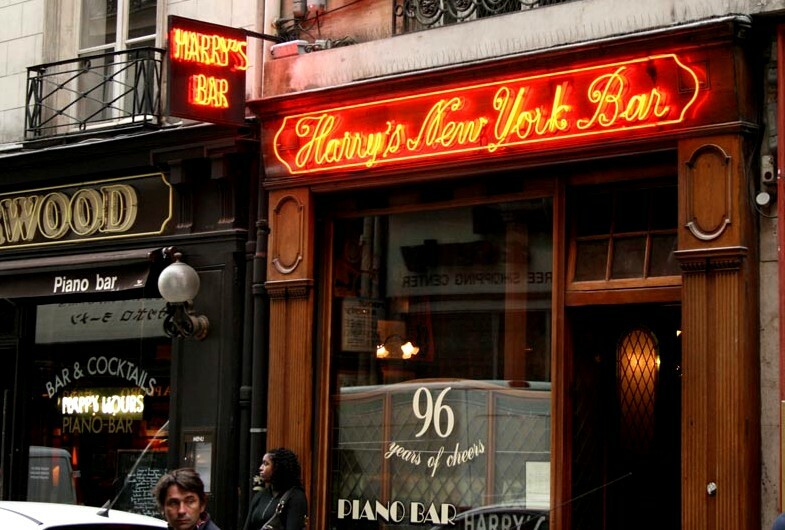 When Sloane was forced to sell the place in 1923, MacElhone bought it and re-named it Harry’s New York Bar. The bar was always popular with American ex-pats, but under MacElhone’s ownership, it became positively iconic. American visitors escaping Prohibition famously knew to tell their taxi driver “Sank Roo Doe Noo” (5 Rue Daunou, the bar’s address). Some of the regulars included Ernest Hemingway, F. Scott Fitzgerald, Gertrude Stein, and George Gershwin. Harry’s New York Bar is still open today, and celebrated its centennial in 2011. It’s currently run by the widow of MacElhone’s grandson’s, Isabelle MacElhone. While it’s become increasingly popular with Parisians, it remains a bastion of American bar culture in Paris. Every election year since 1924, the bar has conducted straw polls of its American customers who have correctly predicted the winner of all but two presidential elections.